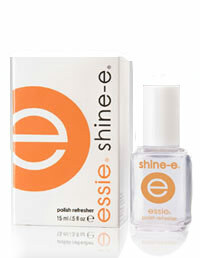 Essie Shine-E Polish Refresher, .50 fl. oz. Gives polished nails gloss and shine, and restores nail polish color in between manicures. To use: Apply to polished nails every other day in between manicures to restore nail color and shine.